Summary: Ida and Gus, two polar bears, live in a big park in a big city. Best friends, they play together then sit quietly on a favorite rock while they listen to the sounds of the city: the cars, the trucks, the buses, the people. “I wish we could see it,” says Gus and Ida replies, “You don’t have to see it to feel it.” So, on their rather isolated rock, they listen together to the city’s heartbeat. One morning Ida doesn’t come out of her cave; Keeper Sonya comes instead to explain that Ida is very sick. One day soon her body will stop working and she will die. Gus rushes to Ida and together they growl, snarl, and howl loudly enough to fill up the zoo. Now the two friends wonder together about where Ida is going; they spend growling days and laughing days; they cuddle. “And one sunny day Ida curled into quiet, her eyes fluttered shut…” Now Gus must face the day without Ida. Sometimes Sondra plays with him and eats lunch with him. Sometimes he forgets and looks for Ida and recalls her words: You don’t have to see it to feel it. He hears the sounds of the city and remembers how they listened together. And Ida is right there. 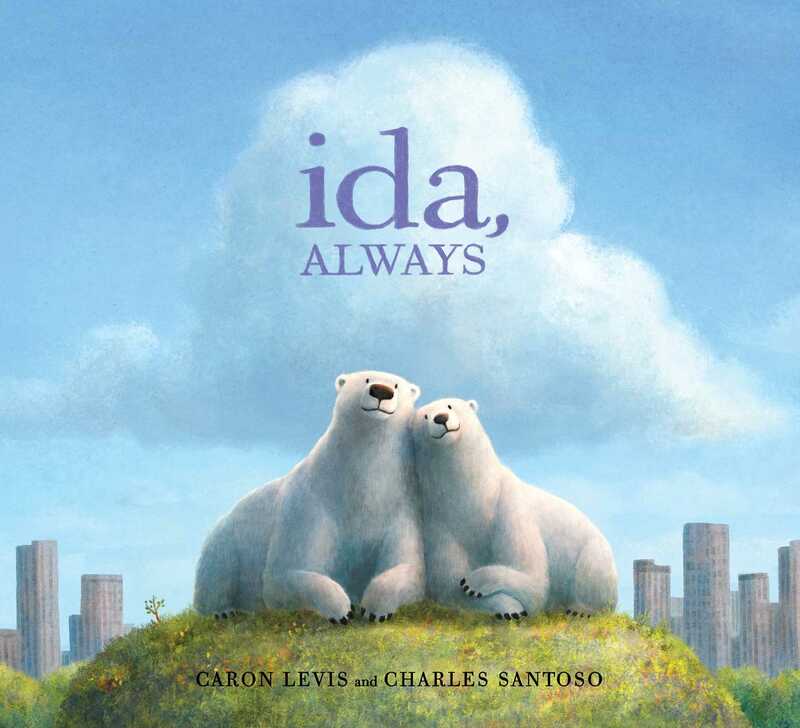 Literary elements at work in the story: This quiet, gentle story of grief and loss is based on two polar bears who lived in New York City’s Central Park Zoo. Over twenty million people from all over the world visited them. Ida died two years before Gus. The book, anthropomorphizing, shows the pain, anger, sadness that are part of death and also shows the acceptance, love, and remembering that are part of grief. City skyline and sky dominate the illustrations and there is strong verbal emphasis on sounds The sounds and the skyscrapers help to show the good life Gus shared with Ida and the continuation of that good life in the present with memories of Ida. The spacious sky is filled with clouds, some assuming the shape of a bear. Theological Conversation Partners: Death is THE fact of life, far more difficult to explain to children than the “facts of life.” Ida and Gus is an occasion to view death through the safe lens of the experience of two animals, attributing to them feelings and understanding that are more human than animal. Ida, Always is an excellent vehicle for acknowledging the reality of death and life. The statement that ends the book is not quite accurate; the memory of Ida, not Ida, is present. The suggestion of Ida as a cloud overhead and Gus and Ida’s speculation about where she is going may lead to a discussion about heaven-where it is, what it’s like, and whether or not animals go there? Trusting God who gave us pets and recalling Jesus’ words that not a sparrow falls without the Father’s knowledge (Mt. 10:29), we can say with assurance that God will care for our pets. Children should feel free to ask and to share their ideas about heaven and we can reaffirm our trust in God’s goodness even when we say, “I don’t know.” Christians have much more to say about death than this but not necessarily in a discussion of this book. The child’s experience will be the guide here. The death of a parent or sibling, or an aged grandparent, the casual deaths viewed in cartoons and the distant death seen in the news all have a different emotional impact. We declare in worship that Christ rose from death on the third day and that we believe in the resurrection of the body. As Christians we can rely on Jesus’ promise that he will be with us always; that he goes to prepare a place for us (John 14); that we can never be separated from his love (Romans 8:38-9); that we will always have the joy of praising God (Rev. 19:6). Ultimately it is God’s memory that we are counting on, not ours. That’s more than children or we can comprehend and it doesn’t all need to be said at once. Gus and Ida live in New York City in the Central Park Zoo. Look at the title page to see what a large city this is. Turn the page and find the island where Gus and Ida live. How do you know that Gus and Ida are friends? What are some of the things that they do together? How do they feel when they learn Ida is going to die? How do they show it? How do they spend their time after they know Ida will die? Gus and Ida wonder where she is going talk about where she is going? Do they have any ideas? How does Gus help himself and Ida when she simply rests in her cave? How does Sonya describe death? If there has been a death in your church or a family known to the children, this is the time to talk about what we do when someone we know and love dies. Gus had Sonya to be with after Ida dies. In the church community we try to help and comfort the one who is sad. Do you know some of the things that we do? This review was written by regular contributor and alumna Virginia Thomas. Ida, Always by Storypath is licensed under a Creative Commons Attribution-NonCommercial 4.0 International License.